We continue the series of all things “round” with this burger recipe. It is a combination of a couple of different recipes and I have also adapted it to include quinoa and some extra vegetables. Of course, the thing with burgers/patties/rissoles/cakes is you can really just add anything to the mix and you can somewhat hide ingredients that you little one is quite picky about. It is pretty normal, or so I have read, for kids to be fussy with their food. Where one day they may have liked eating something and now they sit in protest if it even comes near the plate. Rafaela has so far done this with carrots. It was her favourite as we started on solids, then she wouldn’t have a bar of them and now she can’t get enough of carrot sticks. Also, I have always been pretty adamant about including something green into her meals, zucchini and spinach have been standard but broccoli has always needed to be mixed up in the dish. So beating the Broccoli ban has become a more difficult feat. Even cheese, such an easy snack and a great source of calcium, will only go down the hatch if it’s melted or mixed into her meals. So, like I said, making a burger is a great way to disguise any undesirable foods and this is for all ages! Two birds with one stone in this house. With these lamb burgers, I am able get Raff eating more vegies and my husband, Andrew, eating quinoa. Again, these burgers are very freezer friendly and great for the whole family. They can be served with all your favourite trimmings in a bun or on their own with mash or salad on the side. 1 small Spanish onion (or ½ large), finely chopped. Place dry quinoa into a large fine mesh strainer and rinse with cold water. Place rinsed quinoa into a small saucepan and cover with 2 cups cold water. Bring the quinoa to a boil and turn down to a low simmer. Cook for 15 to 20 minutes. Remove from heat, fluff with a fork and cool before mixing into lamb. You can either finely chop or grate the vegetables or place them into a food processor for whiz. In a large bowl combine lamb, quinoa, egg, onion garlic, vegetables and spices. Mix thoroughly until the mixture comes together and is smooth. 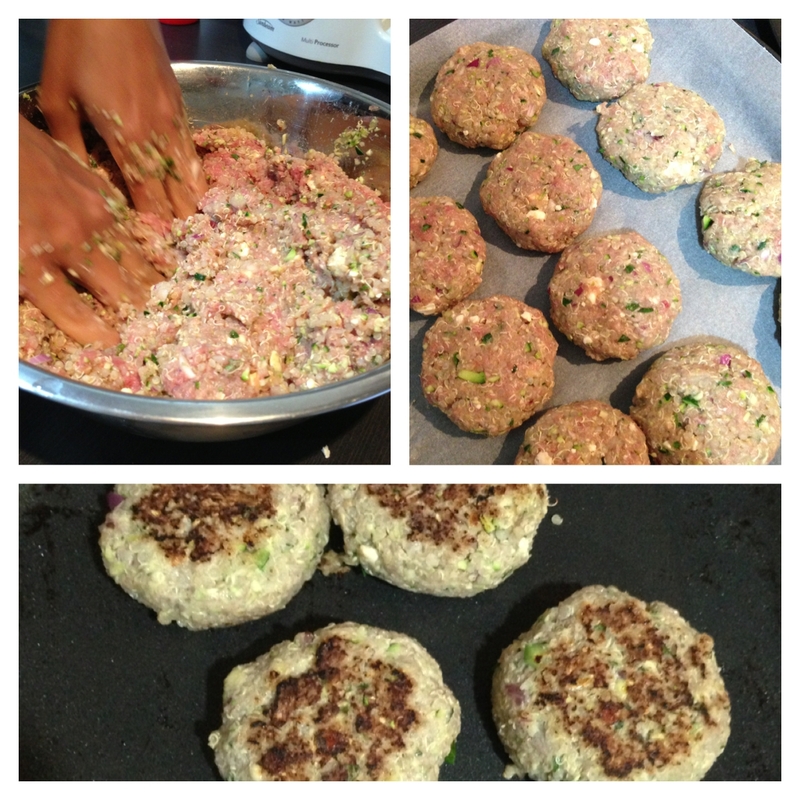 Prepare the lamb burgers by forming them into small balls, usually the width and of your child’s palm. Flatten down into a patty and place on baking paper. Place a large non-stick sauté pan over high heat for 1 minute. Add the patties into the hot pan and brown on each side. Cover and cook on low heat for 10-12 minutes. To plate the dish place the lamb burger with some fresh salad or fresh tomato puree. Top with a dollop of natural yogurt mixed with fresh mint or with some sweet potato mash.